Check Out our Training Schedule for upcoming training sessions. You should expect at least 8- hours of instruction, which includes classroom and range time learning to shoot revolvers and semi-automatic pistols. Enjoy a limited class size to enhance an individual atmospheric. This Basic Pistol Shooting Course will help you obtain your Ohio Conceal Carry license pursuant to Ohio Revised Code Section 2923.125. We own firearms for a variety of reasons, but home defense is among the most common reasons for owning a handgun. this course focuses on the safe and efficient use of a handgun for protection of self and family. 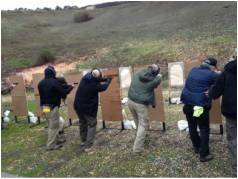 To learn more about firearms and home defense and schedule a class follow the link below. Qualification shooting is an informal, year-round recreational shooting activity that improves marksmanship skills. It's a drill. NRA set the standards; you meet the challenge! Performance is measured against established par scores and any shooter who meets or exceeds those scores is entitled to the corresponding recognition awards for that rating.